What I really want to say right out is that everyone should read this book. 3) Using the past, a different kind of logic, to deduce what we know to be good, what we know to be bad, and what can be attributed to individual variance. 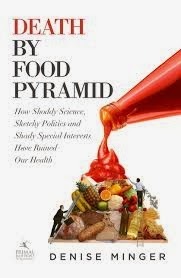 I find the politicking around nutritional guidelines fascinating. You see the interplay between people who REALLY want to do right by the country, who value the scientific process, get steamrolled by lobbyists and politicians with their greatest interest in re-election. There is a level of intrigue that makes the story, for what might seem like such a dull subject, pretty riveting. Then comes the second part, which really is the meat of the book. It starts with a primer about the most common terminology you find in the scientific literature with highlights on where the media and people with agendas tend to misinterpret them. It then follows the research of a handful of nutrition scientists. Minger does a good job taking a measured approach the the characters that history has labeled "good" and "bad". After all, they all really wanted to fix the growing problem of heart disease, and just didn't have a wide enough scope to see what they needed to. The last part is where this book really cemented itself in my heart. Again, following her trend of being, gasp, reasonable, Minger takes a look at three diets that are commonly touted as The Cure, and have a loyal following: Paleo/ Primal, Mediterranean, and Plant Based (covering vegetarian and vegan). Rather than take sides, she analyzes what each of these simultaneously includes, then in a flip of logic, discusses the similarities in what they all reject. Here Minger also touches upon know genetic variations that can change how one person responds great to, say, a high fat diet and another responds great to a high starch diet. This helps to explain why each popular diet has thrivers and failures. All three main diets also have a "look at our ancestry" element to their arguments, so Minger takes us back to Weston Price and his study of native cultures, looking at how they ate, how little disease they experienced, and more importantly, how the switch to modern living changed that disease profile. All in all, this should be a book that anyone with even a passing interest in health, and anyone with a deep interest in health, should read.